One of the strongest Kunoichi, Samui is from the Village Hidden by Clouds and the team mate of Omoi. She is one of the trusted kunoichi by the Fourth Raikage. 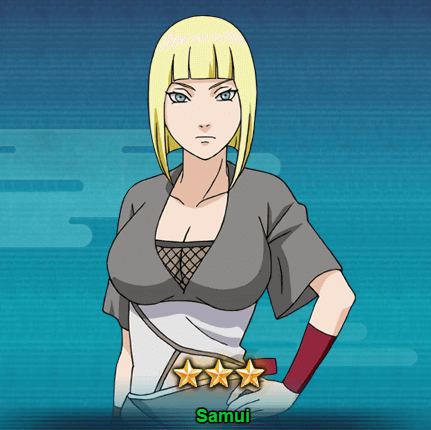 In Naruto Online game, she is extremely good with Lighting team especially the ones with Hidden Clouds Ninja characters. Taijutsu Cloud Style – Flying Blade[Prompt]: Causes Taijutsu damage to a selected unit and will cause this unit to suffer from Tag and Interruption. Taijutsu Taijutsu Attack: Attacks the opponent’s units in the front row and has a chance of causing Knockdown. Taijutsu & Ninjutsu Short Sword-Ascending Dragon: Chases and Attacks Knocked Down unit, causes Low Float and Tag. Can be triggered twice each round. Ninjutsu Assault Techniques: Recovers 15 chakra points every time a Hidden Cloud unit from your Lineup uses a Standard Attack. Ninjutsu Hidden Cloud Elite Lineup: At the beginning of a battle, all Hidden Cloud units in your Lineup will be given a Shield based on 50% of this unit’s Resistance base attribute, their Ninjutsu and Attack will also be increased by 30%, lasts for 3 rounds. The main way to get Samui is thorough Land Of Lightning Treasure. It will take 40-70 or 80-140 seal draws to get Samui because it depends whether you get Samui or Omoi first. Other than the lightning treasure, you can get Samui when there is a Sage Treasure event. You can purchase Samui ninja fragments using coupons or ingots.